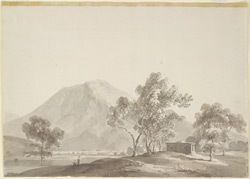 Pencil and wash drawing by Thomas and William Daniell of the view of Atur, dated 24 June 1792. Inscribed on back in ink: '17. Attoor near Dindigul'; in pencil: 'Attoor. Dindigul Dis. 24 June.' The same subject from almost the same viewpoint as another drawing (WD231) which allows us to differentiate between the tightly controlled hand of Thomas and the less disciplined one of William. From March 1792 to February 1793 the Daniells travelled through South India. This Southern Indian view evokes the grandiose dimension of the landscape near Attur, framed by a rugged range of hills. In the diary that the young William Daniell kept we read (entry for 24 June 1792), "Left Dindigul about 7 o clock and had a most delightful ride to Atoor...The Head Man of Atoor, which is a large Village most pleasantly situated, paid his respects to us & brought a present of Fowls, Limes, Eggs, Milk, ect."